The Cincinnati Enquirer published survivors' stories without their fully informed consent. Through an underhanded use of rhetoric, the survivors were led to believe that this project would be an advocacy piece. Their stories and the exchanges they had with journalists are shown in the "Survivor Correspondence" tab. After seeing the published story, one survivor asked #ArrogantAmy to remove their name and videos. She refused to take it down. We reject the claim that #CorruptKate and #ManipulativeMeg just wanted to “lift” survivors' stories and that this project was “always about understanding” for this simple reason: if you TRULY are attempting to be an ally for SURVIVORS and not perpetrators then you would understand the very basic concept of revocation of consent. The Enquirer has shown they have no respect for the consent of survivors. 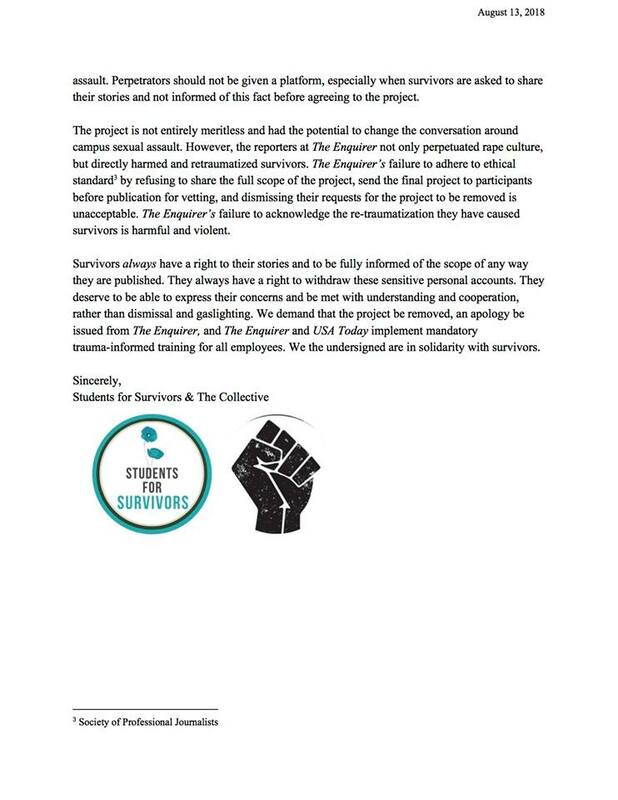 We, along with The Collective at Miami University, call for the article to be taken down, a public apology issued to survivors, and mandatory trauma-informed training be implemented for all Cincinnati Enquirer and USA Today employees. “Last year I did an interview with the Cincinnati Enquirer. I was told by the reporters they were doing a video project about sexual assault on college campuses and wanted to get a variety of perspectives. I was hesitant to do the interview but was told by the reporters that I had a compelling story that deserved to be told. The interview went well, the reporters were nice and made me feel comfortable sharing. Originally, the piece was to be published last year but was delayed. I was nervous, this was my first video interview. 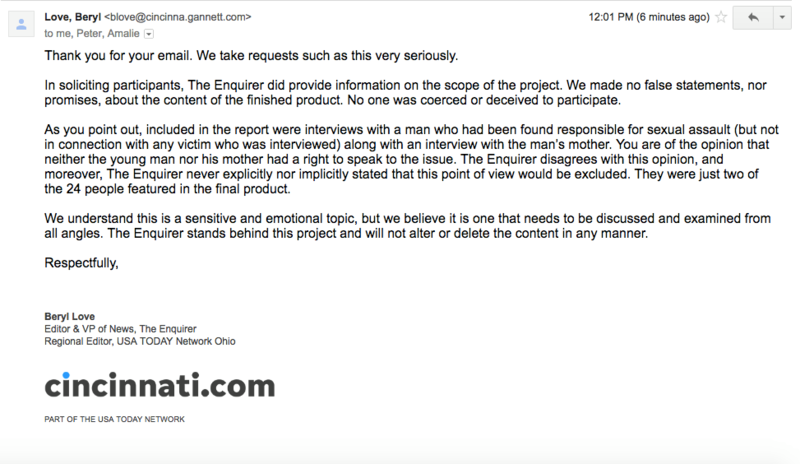 On Wednesday, August 15, we received a response from Beryl Love, the Editor of the Enquirer. The response we received was less than ideal. This is the response from someone who is not trauma-informed and has not done advocacy work for survivors. It’s true, they didn’t lie to survivors. But they failed to listen to suggestions from SFS in May 2017, they failed to honor survivors’ truths and lived experiences, they failed to include critical information that there would be a perpetrator in the videos. These failures have been detrimental to the well-being of ALL survivors, especially the ones included in this project. ​We realize that there are some details that can be left out, as it’s true you never know the final scope of the project. However, once the Enquirer staff knew they were interviewing a disciplined perpetrator, they should have informed the survivors and asked if they wanted to continue to be in the project. 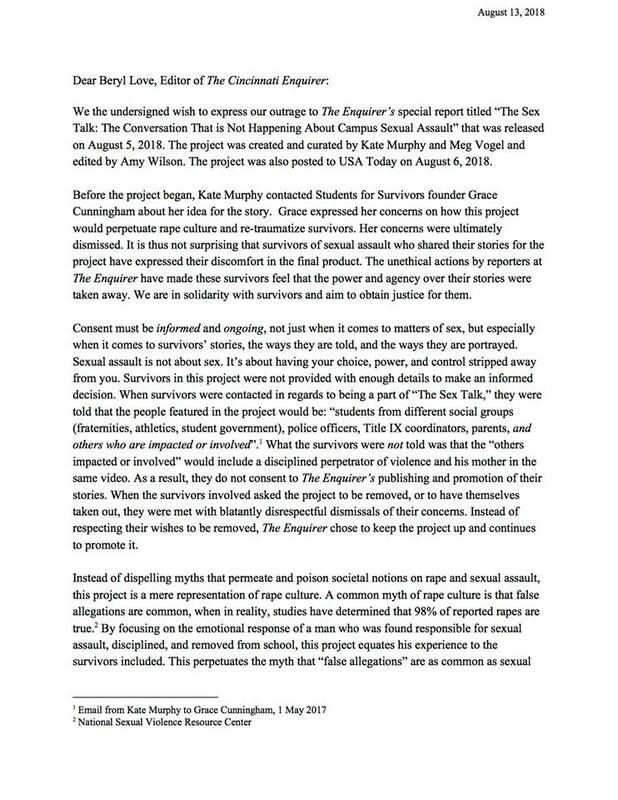 The survivors in the project reached out multiple times for updates on the project, and Kate Murphy and Meg Vogel could have and SHOULD have informed the survivors with this information. As the emails show, the survivors included on the project were justifiably distressed about the release of the project. Not to mention, they should have relayed to participants that they were planning on releasing this project to USA Today. There was an obvious lack of communication and professionalism amongst the journalists who completed this project. Their lack of trauma-informed training is clear, as they took no necessary precautions to ensure the well-being of survivors, further re-traumatizing them and invalidating their experiences. It is clear that these survivors were contacted, used, and manipulated for their stories to fit into the Enquirer’s needs. Amy Wilson, the editor of the project, was also a contributor to the “Seven Days of the Heroin” that won a Pulitzer Prize. It is clear in the Wilson’s response to one survivor and the Enquirer’s dismissal of survivors’ requests to remove the video, that this project was solely created for accreditation and media “clicks.” While we recognize the importance of journalism, we are greatly disappointed with the Enquirer’s refusal to take down the project and to acknowledge the harm it has caused. To the Enquirer: We are disappointed and angered by your response and refusal to address the violence you have caused. We see you, the community sees you, and we will remember this. We encourage you to do better in the future, we encourage you to reach out to reach out to community partners (i.e. Women Helping Women), and we implore you to receive trauma-informed training and implement trauma-informed practices in the future.